Large printed cardboard box. 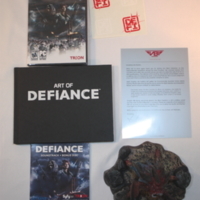 Box is full color corrugated cardboard with internal dividers to hold messenger bag and collector's edition. 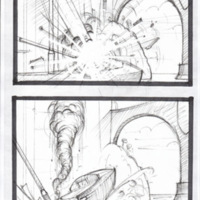 Concept art storyboard panel for Castle Bay, a location in a project originally named 'Heroes of Trion'. Panel 11, continued. 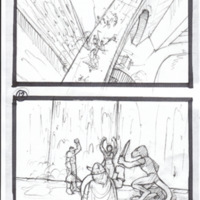 Top frame: a terrified imp falling from the castle wall. 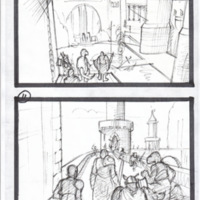 Bottom frame: Birds-eye-view of the battle on the castle wall. 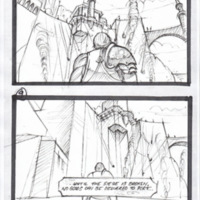 Concept art storyboard panel for Castle Bay, a location in a project originally named 'Heroes of Trion'. Panel 7. 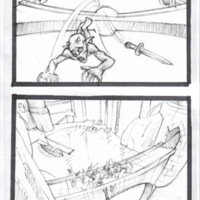 Caption: "Castle Under Siege: Player looks up to see imps all along the top of the castle, shooting down arrows/fireballs."